42LD490 from 2010 or 2011. I baked my LG 55le5400 main video board 3 years ago to fix the HDMI non-working ports and it worked up through yesterday. Now, my TV has a blank screen but the power light is on. All buttons on the remote and on the TV front do nothing. So I baked the board once again (385 for 10 minutes) and it started up with slow motion and darkened blur on the screen which stayed that way even after repeated tries. I took the board out and baked again and voila! Perfect picture and all the HDMI ports are working again! By the way, the horrible toxic smell from baking is a lot less the 2nd and 3rd time around. Another happy customer! I have an LG 42LD550 from May 2010 that stopped working a couple months ago (after powering on, it would freeze on the splash screen). Tried all the resets suggested in various posts, including the two push buttons on the main board, but none worked. Baked for 10 minutes at 385F, turned the heat off and let it cool to the touch. Reinstalled and presto, I have my TV back! Thank you for a truly useful post – like others, I joined and donated some $ to show my appreciation. My LG 50PZ550 plasma stopped recognizing HDMI sources last Friday. I performed the bake here exactly as instructed, especially letting it cool before touching anything. TV is back to normal now. Upon first reassembly, I wasn’t getting a menu, input selector screen, or any image. I was worried I had ruined the TV (well, even more). But I hadn’t felt right about re-clipping the blue ribbon cable back in, that’s the one where the gate clamps down on the cable. I reseated that and that issue was resolved. For those wondering, as a test, before removing and baking the board, I unhooked every ribbon cable and let the board sit for 10 minutes. I plugged everything back in and the problem did not go away…I was wondering if it was the simple disconnecting of the board, maybe from a biOS battery or something? that had reset the HDMI handshake, etc. Well now the TV has a different issue. It will power on, and for just a moment I will see the TV channel image on the screen (I will see the tv program). Then the screen will lock up with static vertical lines or a near whitewash. The audio will keep going. I can change the channel on the ATSC tuner and hear the new channels. I can use the Eco button to make the screen brighter or darker, or turn off altogether (sound continues). I can change inputs too. So the tv keeps working except the screen is bonked. I left it on the brightest setting for 30 minutes to warm up, the powered on and off a few times and eventually it *mostly* worked, just with some stuttering and glitching near the top and a few lines across. Would this still be a main board problem, or more of a Ysus or Zsus issue? I have the service manual, I plan to check the voltages with a multimeter. LG 42LD550 TV bought in 2010. All HDMI ports suddenly stopped working. Amazing, 10/15mins in the oven and it now works perfectly. Thank you sooo much ! I created a login just to comment on this. This fix worked for me! I have a 47″ Samsung LED from this era, and I was skeptical at first, but it worked like charm! Thank you!!! Like previous people I created an account to say thank you. 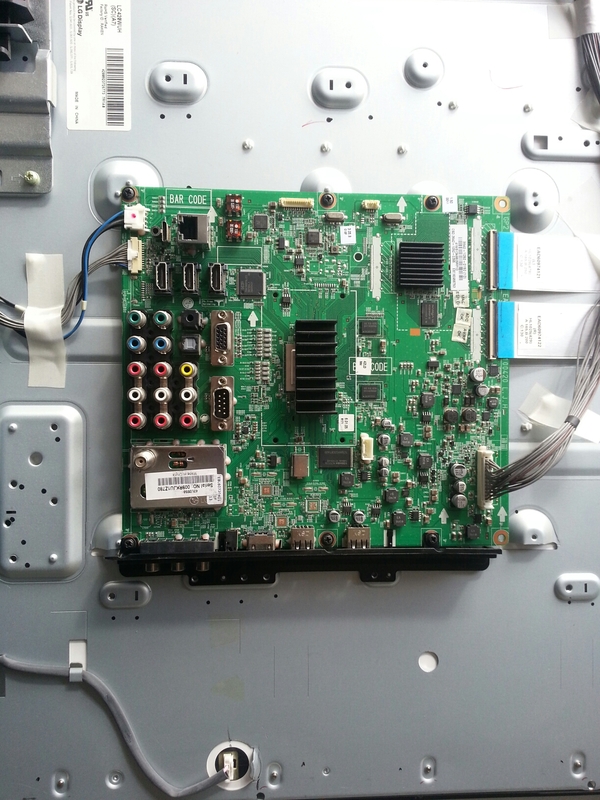 I had what looked like a standard capacitor fail on my LG LCD TV 42DL550 TV. I searched the power board with no obvious failure. The reason for fixing it is it is a 3D TV and these are impossible to get given the changing trends in the market yet I am stuck with a bunch of worthwhile 3D titles. I spent $215 on a new power board. FAIL! This was my last resort. After following the instructions to the letter my only words are THANK YOU. If you have a last resort board where you have tried everything else, you have nothing to lose and remember the difference between F and C.
I almost never post comments or replies. This was GREAT help. LG plasma 3D TV I purchased 7 years ago. HDMI stopped working. I hooked up a component cable and only got audio. Darn. TV is dead. Better Google it. I stumbled upon this page and did as instructed. What the heck, TV is dead anyway. Easy to do. Opened it up and took pictures. Removed the board. Baked it 10 minutes. (Put it on a piece of cardboard) DING! TV is done. Put it all back together. Also very easy. The picture is phenominal and all of the inputs work great. THANK YOU SO MUCH for the fix that made me a TV tech superhero instead of a guy with a TV in the trashcan. I was so happy when the color splotches went away. As I was testing everything, suddenly the HDMI ports stopped working. I figured I had broken something with my soldering. I found that the analog ports worked, so I just hooked up component cables instead. I did find this article, but since I had a working solution I figured it was better to leave it be. With nothing to lose, I once again removed The insane amount of screws that LG uses for the back cover, carefully removed the main board, and baked it according to the recipe. After letting it cool down to room temperature, I carefully reinstalled it, but really did not expect anything positive to happen. But lo and behold, the first thing I saw was the spinning LG cube! All the HDMI ports were now working, so I put it back together and The picture is as good as the day I bought it. Anyway, thought I would share the color splotch problem and solution since LG apparently has a class problem with the solder they used several years ago. Hopefully, they have that fixed. I also have a couple of LG air conditioners and they have been rock solid over many years. Unless there is something on those sustain boards that might melt with the oven fix, I would probably try that solution unless you are comfortable using a soldering iron. The sustain boards are quite a bit larger than the main board , but you should be able to get both of them in a standard oven I would think. For what it’s worth, The solder fix on my sustain boards has held up for about three years now, so I’m hoping the main board “oven fix” will hold up as well. Thanks again for the excellent suggestion and it’s something I might try on other electronics when all else has failed. This fix totally works!!! Moved our old LG 46LD550 from our living room to our loft for the kids after buying a bigger unit. Got the Fire TV Stick all setup so they could watch movies and it was working fine, then yesterday it flickered and failed. Component video worked fine. Did all the reset, power disconnect tricks, but nothing worked. Wasn’t too sure about pulling the board off and baking it, but will all the positive results posted here I figured it was worth a shot before buying a new TV. Carefully followed the step here and sure enough, we had success! My kids are stoked and Dad is the hero. Thanks! Just wanted to comment that this method worked for me too. I picked up 42LE5400 for next to nothing at a local thrift shop. I was warned by an employee that the fellow who dropped it off said that some hdmi inputs were inoperable. While displayed in the store, I was able to verify that one of the 4 inputs were working. However, once I brought it home, all inputs were not connecting. I tried for a week off powering down and reconnecting the TV with no success. After searching the internet and landing on this page, I thought I’d give this method a try. I removed the A/V input daughter board and placed it on cardboard in my gas oven for 15mins at 400 deg F. Even with an exhaust fan there were some fumes present but not unbearable. I was worried about the open flame of my oven but nothing extraordinary happened. After letting it cool in the oven for about 45mins, I reinstalled the board. I let the TV sit for 8hrs before I powered it on. After powering on I was surprised to find that my hdmi inputs appeared to work now! Thanks for all of the detailed information.